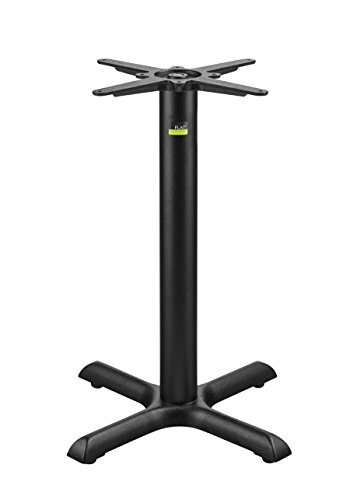 The FLAT Auto-Adjust KX22 dining height table base is manufactured of high-quality cast iron finished with a black powder coat. This base is fitted with the self-leveling FLAT technology providing the ideal solution for those pesky wobbly restaurant tables. The revolutionary FLAT technology ensures that these table bases remain stable each time they are moved. Regardless of how many times they are moved, they automatically adjust to the surface below, locking firmly into position. Also, when two tables are pulled together to accommodate a larger party, FLAT technology allows you to align tables creating a flush surface where the table tops meet. Reduce complaints, save time and cater to groups effectively using FLAT table bases. If you have any questions about this product by FLAT Tech, contact us by completing and submitting the form below. If you are looking for a specif part number, please include it with your message.